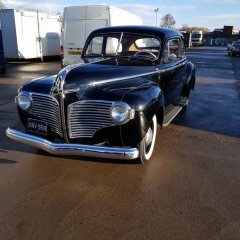 1940 DeSoto Deluxe 2 door sedan, was my great grandfathers car. Early Montgomery Wards Stately 1.5 hp stationary engine. I'm no body man but that is the method I was planning to try. thanks. Rich, I resent the email. It didn't like the D to be capitalized. Thanks, Yeah I really wished it was a bz coupe but I'm happy with it. Well I'll probably get booted off this forum by the moderator, as I'm sure this is not the correct method to post pics. But here they are. Trying to figure out how to post pics. Says can't do more than 3MB. Hello Rich, what is your e-mail? i tried to send it to Desoto1939@aol.com and it got returned to me. Thanks Dan. Yes I do have an original shop manual for the DeSoto. I totally understand about getting lost in the forums. I have been a member on a Diesel forum for about 1 1/2 years and and have learned a great deal on there. Thanks DrDoctor!!! It was actually my great-grandfathers car. Best I can tell he bought it used in 1953 (I have the title from 1953). When he passed away around 1963 or 64 they had his farm sale and my uncle purchased the car. My uncle pulled it home and never did anything with it. Then in the fall of 2017 my uncle (in his 80s) had a sale and sold off about 40 of his cars from his collection and this one was on the list. My dad and I were looking at the sales list of cars selling and my dad said "that was my grandfathers old car". I knew then I had to have it to keep it in the family. Hopefully one of my kids will pass it on to their kids. I do all my own work as much as I can and love working on older pieces of machinery. This is my first "Mopar".